The genius of Jackie Wilson is resurrected at the new home of Black Ensemble Theater. We hear from the founder of the theater about 35 years of performances -- and building for the future on Chicago Tonight at 7:00 pm. 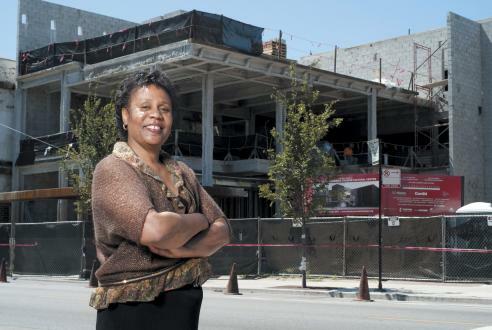 When the Black Ensemble Theater opens its door for the first time at its spacious new 4450 N. Clark St. location this Friday, November 18, it’s as much a Cinderella success story for the theater as for its founder and pioneering artistic director, Jackie Taylor. After 24 years in basement digs at Hull House on Beacon Street, the new sophisticated space around the corner is replete with a 299-seat main stage, a 150-seat studio theater, and a glossy collection of rehearsal spaces and classrooms. With lofty 80-foot ceilings and a high-flying rigging system to match, the new space finally gives a suitably fitting venue for Taylor’s artistic vision. The new location is also a game-changer for the Ensemble’s business model as much as its theater values. While the company will have to adapt to the enlarged venue, so will the management: the Ensemble will have a general manager for the first time, who will oversee an initial $2 million budget, a necessity to maintain the theater’s bars and buffets (and possibly rooftop garden parties), and will even have to learn how to navigate reserved seating through Ticketmaster for the first time. Taylor formed the Black Ensemble Theater 35 years ago while teaching at Byrd Community Academy, near the infamous Cabrini-Green housing project where she grew up. The Theater’s main goal was, and still is, to eliminate racism. The Theater is known for producing entirely original biographical shows about black music, acting as a medium to illustrate African American history, give voice to marginalized communities and reach across cultural bounds. As a teacher, Taylor saw students daily whose needs weren’t being met. But there was one need in particular, for black-focused entertainment, which she was more than happy and capable to fulfill. Since then, Taylor has produced and written over 100 plays and has also appeared in numerous films, plays and television shows with the likes of Sidney Poitier, Laurence Fishburne, Vanessa Williams and more. Taylor is now president of the African American Arts Alliance. She has received many prestigious awards, including the League of Chicago Theater Lifetime Achievement Award, and she was also named one of the Top 10 in the Arts in the Chicago Sun-Times’ 100 Most Powerful Women and “Producer of the Year” by the National Black Theater Festival. The Black Ensemble Theater will christen its stage this Friday with the reprise opening of The Jackie Wilson Story, the 2000 production which first brought national attention to the theater.